* SMS is not available. * SIM card is not refundable after purchase. Your phone must be compatible with the following 4G LTE / 3G frequencies. Is Nano size SIM available? COMST SIM is Nano size. You can use it as Micro or Mini size SIM with Nano SIM adapter which is included in the package. How do I activate SIM? 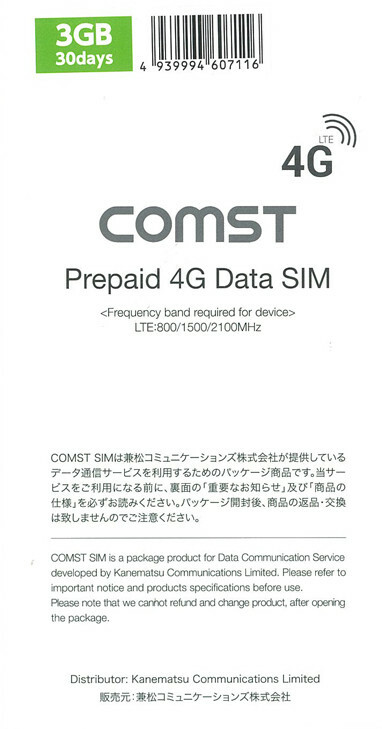 1,Activate the SIM by COMST application. 1. Tap [Mobile] or [Cellular] on Setting. >> If APN setting is not working with this method, please check FAQ below. 1. I cannot set up the APN. The APN setting won’t work without a SIM card. Please insert a SIM card first, and then set up the APN. iPhone >> Download online https://www.comst.info/en/download.html Android>> Your APN setting may be wrong. Please check the setting carefully and choose the created APN. 2. What do I do if my SIM card isn’t working? Please ensure that: - the APN setting is correct. - SIM card has been activated and you’ve got an email. - The other settings are also correct: Mobile network: On Enable 3G(or 4G): On Data Roaming: On If SIM still does not work, please re-insert SIM and turn on/off airplane mode several times. For iPhone or iPad, please delete the APN profiling and re-download it. 3. How can I top up data?/ How can I check my data usage? You can do everything on the app! Please login to your app and top up your data!!! 4. I cannot use internet after coming back from Japan. Please set up the default APN setting. The Original APN setting should be informed on the website of your mobile provider. If you download the APN online, please remove the profiles.